It’s not clear if the EPA has removed anything, but now there is a record of the original site, just in case. When a federal agency receives three or more Freedom of Information Act (FOIA) requests, it is legally required to release the requested document. 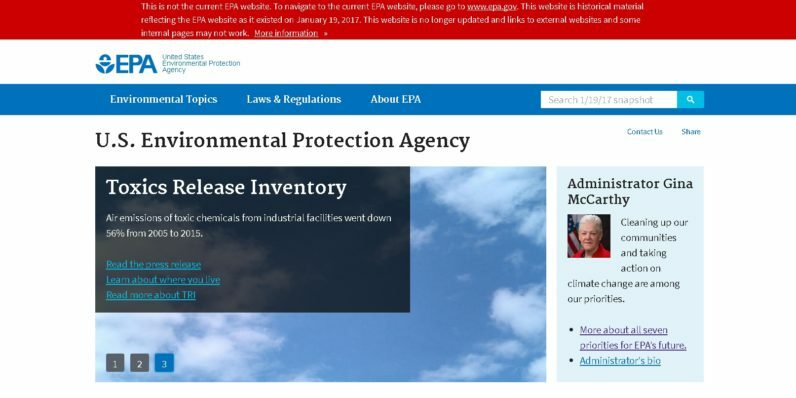 In this case, the “document” is the EPA’s website on the day before President Trump entered office. This website is historical material reflecting the EPA website as it existed on January 19, 2017. This website is no longer updated and links to external websites and some internal pages may not work. Clicking on the header leads to a page detailing what is and isn’t on the snapshot. The EPA can’t save databases because they’re constantly updated. It has, however, saved all of its static pages on environmental topics and laws, as well as PDF reports. On the same page, the EPA provides links to large collections of content not saved in the snapshot. These include Searchable News Releases and AirNow’s Air Quality images.